While the fifth volumes of the various other Green Lantern titles wind in and out of one another in a variety of smaller crossovers, writer Justin Jordan gets a single volume to do his own thing in Green Lantern: New Guardians Vol. 5: Godkillers (for the most part, while still dovetailing into the upcoming "Godhead" mega-crossover). In this, we get Jordan using New Guardians well as a Star Trek-ish planet-of-the-week sci-fi anthology, as he did in some part last volume, in which White Lantern Kyle Rayner's tour of the universe with the "new Guardians" brings them abreast of weird and wild cosmic phenomenon. As the least connected Green Lantern book for the moment, New Guardians appears to hold second-tier status, but each of Jordan's New Guardians I've read I've found interesting in a speculative sci-fi vein. Jordan also uses a couple aspects of the Green Lantern and Kyle Rayner mythoi well; at the same time, underlying the whole book are a couple problematic character choices that work in-book but not in view of the Green Lantern franchise as a whole. At the end of the Green Lantern "Lights Out" crossover, Kyle Rayner entered the impenetrable Source Wall (of Jack Kirby's Fourth World fame) and then returned with no memory of what he encountered there. We get the first hints in the middle of Godkillers, in the New Guardians Annual #2, when Kyle recalls that he was exposed to the "equations" that control all life and was able to manipulate them. This revelation comes as Kyle fights his evil double, made up of Kyle's doubts and fears, whom Kyle released while within the Source Wall and whom he dubs "Oblivion." Jordan bookends these two chapters between two three-part stories, "Godkillers" and one involving the Green Lantern alien Psions. 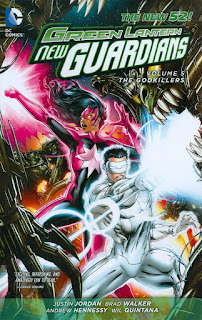 "Godkillers" is what I would deem quintessential New Guardians, in which Kyle, Star Sapphire Carol Ferris, and the Templar Guardians arrive on another planet where all is not what it seems and get caught up in the planet's conflict. This time, Kyle suspects the influence of an alien cult on the populace, but things are complicated when a group of "Godkillers" target the seemingly-benevolent goddess X'Hal. Jordan's story is mildly ponderous, perhaps not requiring three issues to tell, but there's also enjoyment in giving oneself over to the intricate details of the origins of all sides involved. As Kyle vacillates between faith and doubt and whom to trust, so does the reader, and Jordan offers a nice examination of religion here against a sci-fi canvas. In comparison to "Godkillers," the final Psion story has (relatively) less dialogue and some larger panels from artist Brad Walker, suggesting maybe a little padding to match up with "Godhead." Still, Jordan and Walker offer a nicely scary issue as Carol stumbles around a ghostly alien ship (Walker and fellow artists do well overall, alternating between a Kyle with an animatedly distorted face in the lighter moments and more controlled work at others). On the heels of Oblivion, I also liked that Jordan brought back the Psions (my first guess was mutated Manhunters), though the reveal gets lost somewhere; at some point the characters just "know" that these are the Psions. And the end, of course, offers a specific nod to "Godhead" to come. The most problematic part of New Guardians remains Carol Ferris. In-book, Kyle and Carol are a lot of fun, neither one ever letting the other, or the reader, forget the joyous absurdity of their spacefaring situation; were Carol some new character, there'd be no difficulty. But it remains that no sooner did the new Green Lantern titles team of Jordan, Robert Venditti, and others have Carol break up with Hal Jordan than she immediately takes up with Kyle really without much cause, positing Carol as a romantic football among the Green Lantern men (and finally kissing Kyle this volume). I half-hope that the next book reveals Carol not to be in love with Kyle so much as just needing love in some form to continue as a Star Sapphire. That doesn't do Carol much better as the franchise's most recognizable and also perpetually-lovesick female protagonist, but maybe an element of mind-control here is preferable to Carol just jumping from Hal's arms to Kyle's by dint of her own poorly-construed personality (better overall would have been if Carol and Kyle remained "just friends"). But that is a franchise issue, and if one can ignore that and just take this title for what it is, Green Lantern: New Guardians Vol. 5: Godkiller is an enjoyable cosmic DC Universe book. To some extent this is Justin Jordan's "final" independent New Guardians volume, given that "Godhead" takes up much of the next book (an independence, perhaps notably, none of the other Green Lantern titles received). Jordan didn't have terribly long on this title, but what he did have presented Kyle Rayner well, and it makes me enthusiastic to perhaps follow Jordan to some of his creator-owned titles.